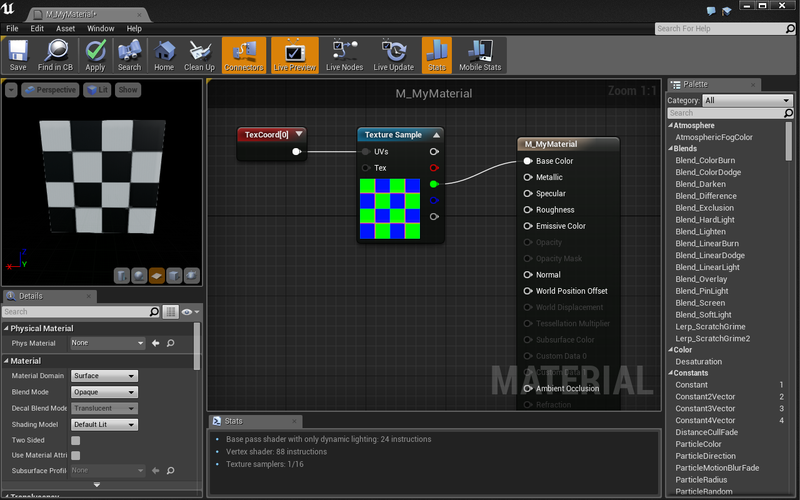 Welcome to the Material Editor! There are many options and new nodes to play with in here. If you are familiar with programming shaders, you’ll be right at home once you get comfortable using UE4’s visual nodes. We’re going to start by creating a simple, solid color material. Right click and place a Constant3Vector. You can also hold the 3 key and left click. A 3Vector is often used to represent color, each number corresponding to the Red, Green, and Blue channels. You can see that the preview in the upper left has updated. 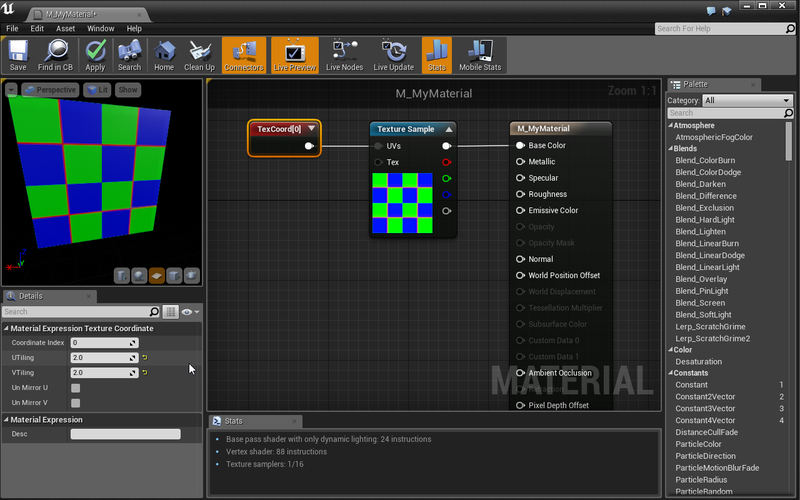 That’s what your material will look like on a mesh in your game. Woot! You just made your first material. Let’s step it up a notch and learn how to use textures in our material. Textures are images (think .jpg and .png) that we can use to add detail to our materials. A lot can be done with just math, but textures give us a ton of freedom and control. Much better! Let’s add a texture. 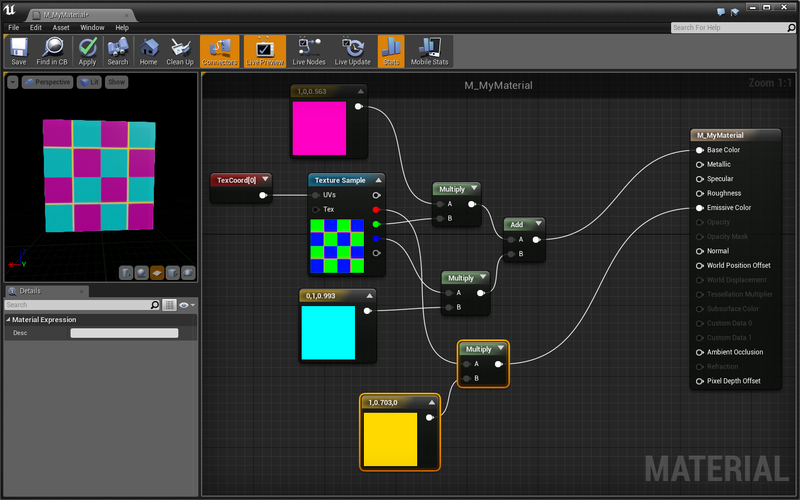 Right click the graph and place a Texture Sample node. Now you can see our material use the texture’s colors as its Base Color. Okay. It’s time to talk about what is really going on here. A Material is a series of math equations that are run once per pixel. In graphics, these are referred to as fragment shaders. GPUs have been designed to run these equations extremely fast, allowing us to program complex behavior in our graphics. 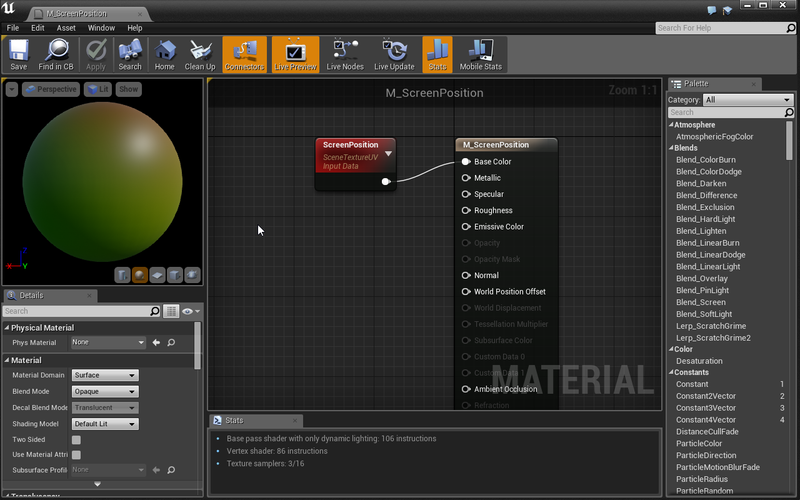 Some inputs of the Material Node are only run once per vertex (vertex shader), namely the World Position Offset which is used to offset the mesh vertex location. Every pixel has data that we can access in our material. For example, we can get the pixel’s WorldPosition, ScreenPosition, Normal, and much more. Let’s use the pixel’s ScreenPosition to demonstrate the power of fragment shaders. The ScreenPosition node holds a 2Vector of the pixel’s location on the screen. The position is stored relative to screen size with values between 0 and 1. A pixel in the upper-left corner is at [0, 0], a pixel in the center is at [0.5, 0.5], and a pixel in the lower right is at [1, 1]. 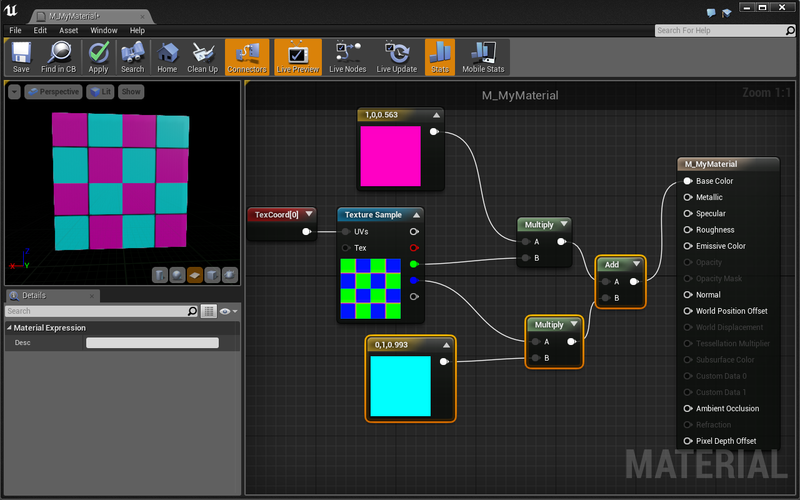 Our material is using these X/Y values as Red/Green values and creating a color based on them. Let’s see what it looks like in the world. Now test it out in the Level Editor! Each of the cube’s pixels are colored based on where they are on the screen. Great! Now we see that each pixel has unique data that we can use to change its color. If you want to play with this more, try using the WorldPosition or PixelNormal data in the material. Let’s get back to Textures and M_MyMaterial. 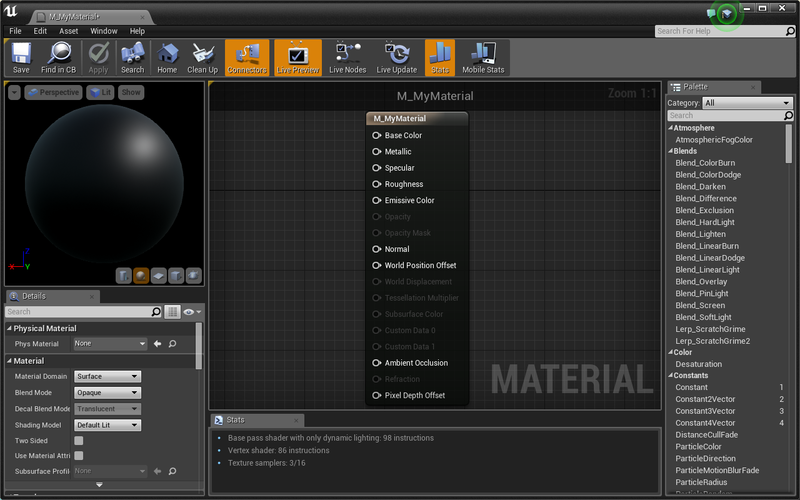 Our material preview should still be using a plane as its preview mesh. Go ahead and change it to a plane if it isn’t already. As you can see in the preview, the TextureCoordinate holds a 2Vector (similar to ScreenPosition) which displays the pixel’s coordinate relative to the mesh. For our plane, a pixel in the upper-left corner is at [0, 0], a pixel in the center is at [0.5, 0.5], and a pixel in the lower right is at [1, 1]. A pixel’s Texture Coordinate is defined by the UV map of a mesh in a 3D modeling program. Essentially, a UV map is all the faces of a mesh laid flat on an coordinate system that spans from 0 to 1 in two dimensions. This is how we map flat textures to complex 3D shapes. Textures use Texture Coordinates in order to output a different color per pixel. If the pixel is at texture coordinate [0.1, 0.4], the TextureSample grabs the color of the texture at location [0.1, 0.4] (relative to the texture’s size). The reason multiplying the TextureCoordinate also tiled our texture is because our TextureSample is set to wrap. This means that an input of [1.1, 1.4] is the same as an input of [0.1, 0.4]. We could set our TextureSample to not wrap by changing its Sampler Source in the details panel. Great stuff! Let’s use this texture as a mask to take more control of our material. Woah, cool! Now we have complete control of the checker boxes that are white on the Green channel. This works because we are either multiplying our color by 1 (white) or 0 (black). This is the power of masking. Let’s take control of the other set of checker boxes. The mask you need is in the Blue channel of the TextureSample. Do the same thing you did for the Green channel with a new color. Combine the two checker sets together by adding them together using an Add node before inputing into BaseColor. These methods of previewing allow us to visualize and understand what is happening with each math node. Coolio! 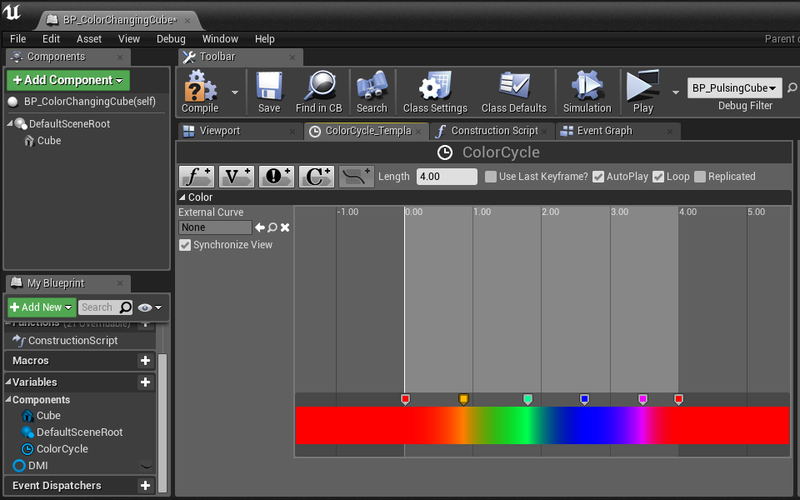 Let’s use the final Red channel to mask out an emissive color. So far we’ve only worked with the BaseColor input of our material. Now we’re going to use the EmissiveColor input. 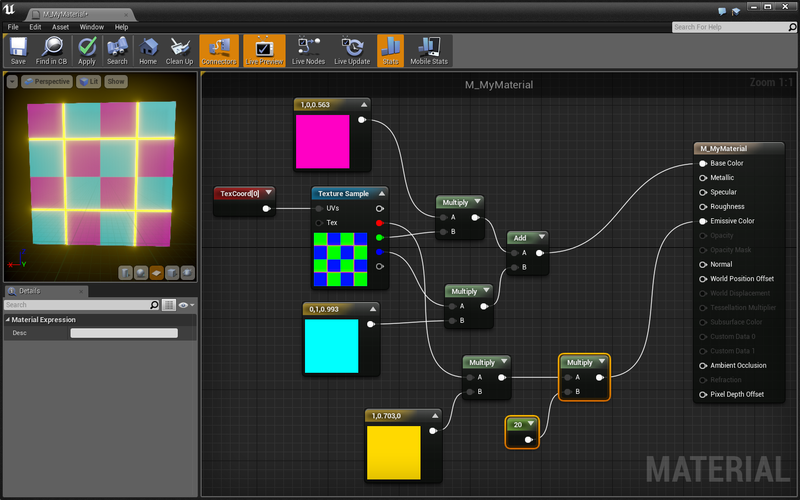 Emissive Colors supply their own light. This means that light has no effect on their appearance and they’ll still be visible in a completely unlit room. Emissive Colors are also a great way to take advantage of UE4’s bloom effect. Let’s get cracking! 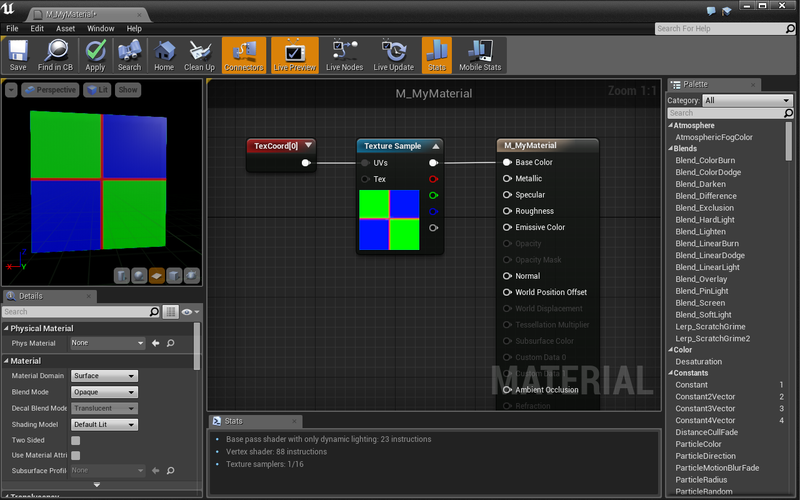 Use the Red channel of our TextureSample to make a mask for the material’s EmissiveColor input. 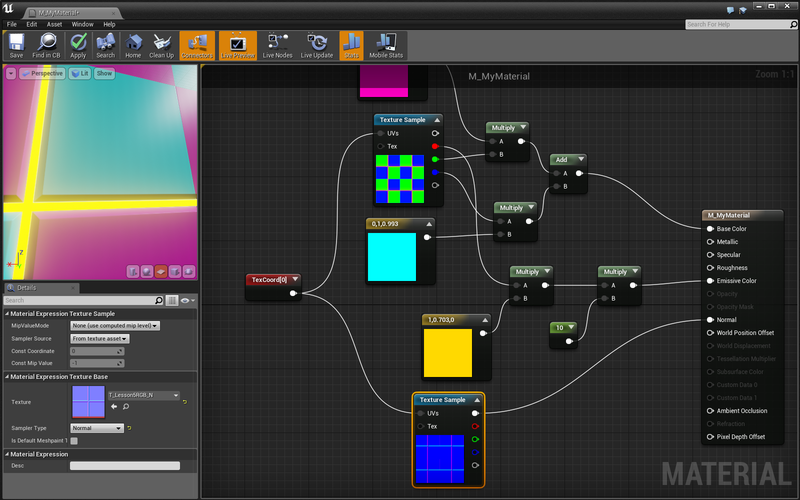 In order to make our emissive lines glow using UE4’s bloom, we need to push the color values beyond 1. 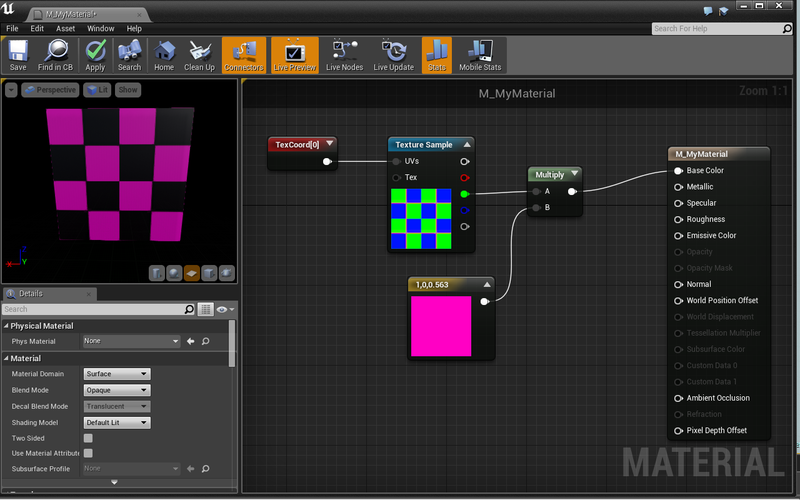 Multiply the emissive color by 20 before inputing it into EmissiveColor. Nice, now that line is really glowing! 20 might be a little high in practice, but it demonstrates how to utilize UE4’s bloom effect. The final thing we’re going to do is add a normal map to our material. Normal maps are a type of texture that define a pixel’s normal at a specified location. A “normal” is a vector that points in a direction perpendicular to the face. Engines like UE4 use the normal data to affect lighting and shadowing, giving flat objects the appearance of depth. One thing to note, normal maps are not as effective in VR as they are in monoscopic experiences. The reason is that in VR, we can truly see 3D depth. In this way, even if the lighting suggests that a flat plane is actually a jagged stone wall, when we get close we’ll see that there is no depth at all. You can see that there is now the appearance of a slight bevel from the checkerboard pattern into the emissive line. You may have to turn down the bloom to see it clearly. Great stuff! We’re done with our material. Now we’re going to talk about using material parameters. Right now, our material is completely set in stone. There is no way for us to easily change the color of our checkerboard or glowing line without editing the material itself. This is because all of the values in the material (like color and brightness) are set with constants rather than parameters. Let’s change that. Wonderful! Now we can use these parameters to easily make new, unique versions of this material. We do that with Material Instances. We discussed Material Instances in Lesson 1, but now we have a new understanding of what is going on. Let’s make some new materials! 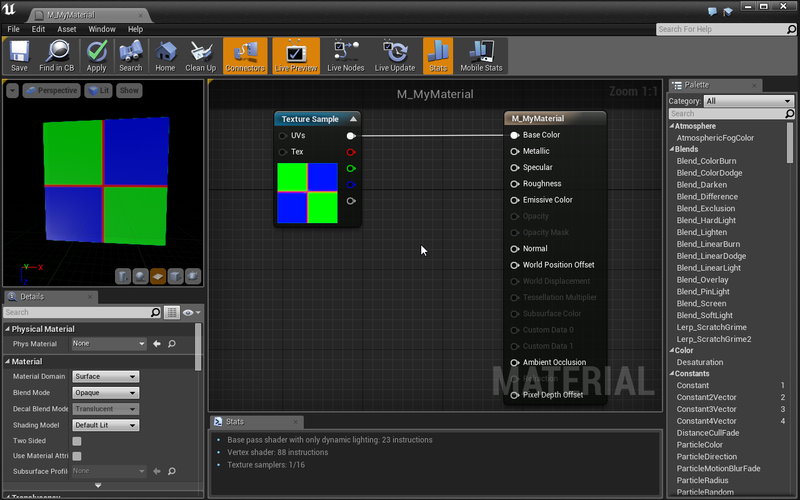 Now that you’re in the Material Instance Editor, you can see all the parameters we created! 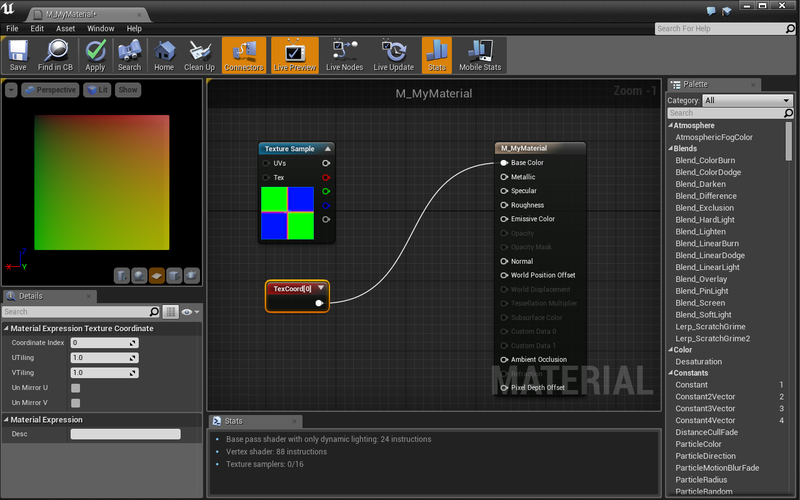 From here, we can easily change our parameters to create unique versions of the material. Yay! Now that you know all about materials and what a material instance really is, you can start to dig into Layout’s Base Materials. They provide a ton of parameters that allow you to make almost anything you want! Parameters in our materials are extremely powerful. Not only do they allow us to make many unique versions of the same material, they can also be changed in real time using code! Let’s create a cube that uses a dynamic version of our texture to cycle the LineColor parameter through a series of colors. 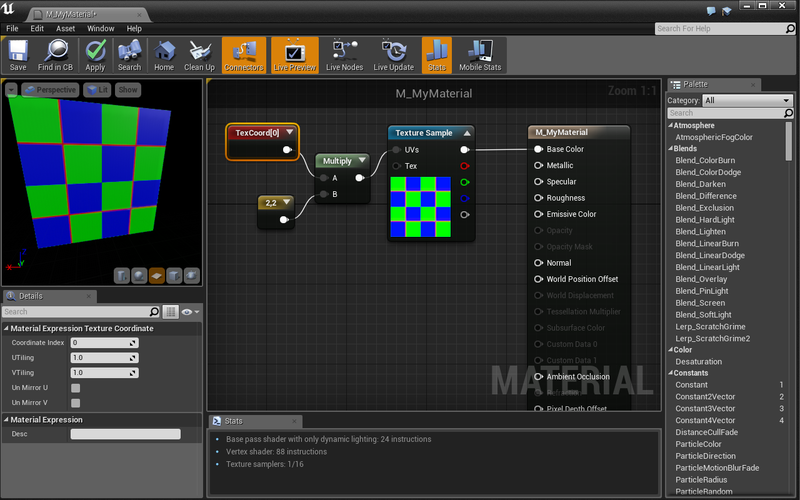 The Create Dynamic Material Instance node takes a static mesh as input, creates a dynamic version of its current material, then sets the mesh’s material to the new dynamic version. We have to store the output so we can update the dynamic material at some point in the future. Well done! You’re on your way to becoming a material master! What you just learned about materials is extremely powerful. You can now isolate parts of meshes using masks, make your material glow, and add detail with normal maps. You may be happy to find out that we’ve truly just scratched the surface of what can be done with materials. If you’re interested in learning more, a great place to start is UE4’s Content Examples. Go to the Learn tab of your Epic Games Launcher. There you should be able to download the Content Examples project. This project is a huge resource of examples, and is supported by the corresponding documentation.